Some sent letters just hours to the city of Dallas just hours after President Kennedy had been shot. After the president was killed, hundreds of people across the country mailed their thoughts to the city of Dallas. Dallas Mayor Earle Cabell kept the letters and donated them to SMU. Pamalla Anderson is the DeGolyer Library’s head of public services. She knows the letters better than anyone else. The letters surprise Jeffrey A. Engel, director of SMU’s Center for Presidential History. One recent afternoon, Pamalla Anderson pushed a cart into the SMU DeGolyer Library. On it were two boxes filled with hate. Anderson, the library’s head of public services, knows these letters better than anyone. Just hours after President Kennedy was killed, people whipped out their pens and typewriters and dashed off their thoughts. They came from across the country – California, Minnesota, New York – and started pouring in to the Dallas Mayor’s office. Just 48 hours later, Lee Harvey Oswald was killed blocks away from the site of the assassination – and more letters arrived. Jeffrey A. Engel, director of SMU’s Center for Presidential History, is surprised by the letters, even after reading them many times. In recent months, more scholars and researchers have sought out these letters, yearning to know more about the mood of the country in the fall of ‘63. Some letters are scrawled on scraps of cream and pale blue paper – the ink is smudged, the handwriting hard to read. Others are written in black ink in the neatest cursive. Some typed on business letterhead. All were sent to Dallas Mayor Earle Cabell, who gave his personal papers to SMU. During JFK’s fateful visit, Cabell rode in the presidential motorcade. Soon after Kennedy was killed, reporters asked him if what happened would tarnish the city’s reputation forever. "Do you own a horse?" Cabell responded to several of the letters, often defending his town. But there were notes of support. One even came from Buffalo, where President McKinley was killed. The letter expressed sympathy and understanding for what Dallas was going through. One child from Minnesota sent a note, saying her teacher had informed her of what had happened to Kennedy. But she had more pressing questions: Did the mayor have a big home? More importantly, did he have a horse? Tucked away in all those folders filled with hate: a little laughter. Los Angeles: "You've taught us to loathe the lowly ignorance of your citizens -- to loathe your lack of national respect -- & to loathe your complete absence of pride for your own country." London: "This whole Scandal is like turning over a rock, which your City represents, and to see all crawling lice beneath it." A junior-high social studies class from Kenmore, N.Y.: "We hope you will have faith in your future and not let this incident destroy your progress." Waco: "It has been very clear, that the city of Dallas is not so much interested in its own intrinsic fault ... as it is in leading others to believe it was not at fault at all." Kenton, Ohio: "It is not right that all Dallas should take all the blame for the President's death. Enclosed is a poem (if you can call it that), it expresses of what I'd like to think all America should think and feel." Little Rock, Ark. : "We have appreciated very much your leadership in the midst of this great tragedy. ... [I]f we remain steadfast in our thoughts and our ideals, if we keep busy with our families and business responsibilities, we will emerge more prosperous, more self confident and with greater character than we otherwise could ever have achieved." Huntington Park, Calif.: "Of the thousands of ridiculous actions riding the wave-crest of national hysteria, following the assassination of President John F. Kennedy, the inclination to make the City of Dallas Texas a shameful scapegoat for this historical incident, certainly hits an all-time high in zany thinking, but perhaps a retelling of an ancient Islamic Fable may be the key to help us regain our senses." 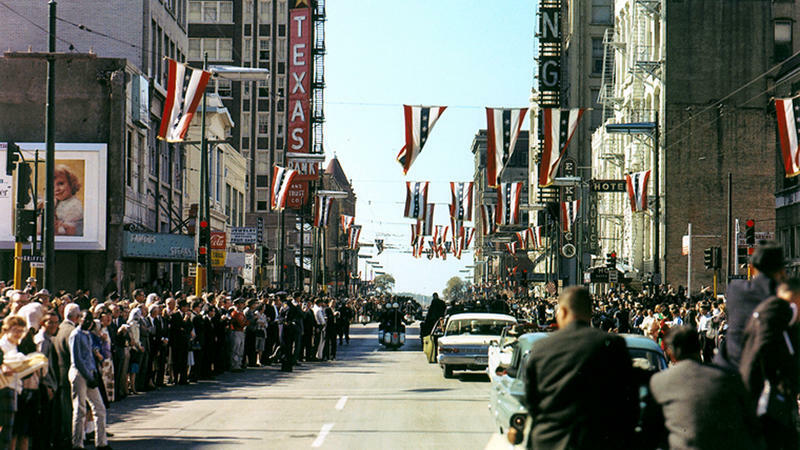 Texas wasn't exactly a backwater in 1963 when President John F. Kennedy was assassinated in Dallas, but it wasn't the economic and political powerhouse that it has become today. Over the past 50 years, three of the nation's presidents have hailed from Texas. "For the past few decades, Texas politicians have found a natural habitat on the national political stage in the way Dominican shortstops have found a natural habitat in baseball," the humorist Calvin Trillin wrote a couple of years ago.